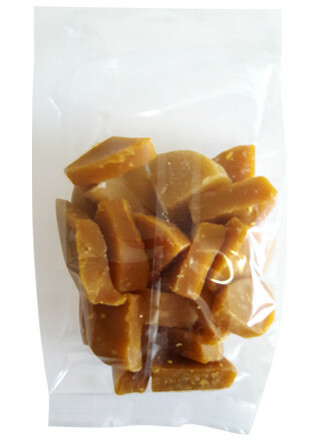 These golden-brown chunks of pure natural beeswax from Simply Bee are a must-have for those of you who enjoy eco-friendly DIY. Beeswax pieces can be melted down to create non-toxic lotions and lip balms, candles and soaps, even wax crayons and modelling clay – the possibilities are practically endless! Simply Bee brings you 100g of luscious local beeswax, made without preservatives, bleaches or additives so you get nothing but pure natural goodness. Even great for making non-toxic kids’ crayons or modelling clay! Did You Know? You can chew on a small amount of beeswax for hours, as a chemical-free alternative to chewing gum. The wax will eventually dissolve. This beeswax has turned me into quite the alchemist, making countless salves and innumerable ointments. I love the aroma and quality of this product, and the fact that it really has revolutionized my beauty regime. Excellent product! I use it to make my lipbalms and footbalm. It works very well! I've used it to make body butter and it worked perfectly. I've just ordered some for other projects. Great for homemade beauty products. I used this in my homemade face cream and it worked great. Would definitely buy it again. Great product - I used it to make my first batch of lip balm and body butter, and it worked like a charm! A must have for a DIY girl!!! This beeswax is phenomenal. It is exactly what I was looking for and blended in well with the body butter I made for my psoriasis. Easy to use, created lotions to treat my son’s eczema. Love using it in lotions and lip balms. I used it to make a balm for dry skin. Mixed it with Shea butter and coconut oil. Worked perfectly! What a great product - for all those little DIY's you have planned in making your own cold cream. Love how simple it is to use in all your beauty product DIY's! Great smell and fantastic for making home made candles. Love this product! I have been able to make a candle out of one pack. The size of the chunks are perfect for melting. Lovely natural honey smell. Great product! Although 100g seems like a small amount, a little of this goes a long way especially if you combine it with another oil (I used coconut oil). I used it it to make a headache salve. Added it to my DIY moisturizer. Great quality! Good quality and quantity. I love all the Simply Bee products! I use the Simply Bee Pure Beeswax for making my own coconut oil lotions. Essential for getting the oil and water to emulsify! Wish it was packaged in paper! Given its light weight - a paper bag would work just as well. I've been buying this since 2016 and swear by it to make my body butters, lip balm and hot balms. I really like the idea of it, Natural way to make products! This is an essential in my house - I use it to make my own lipbalm and handbalm. I got some to make my own sunscreen. i'm happy with how it worked. 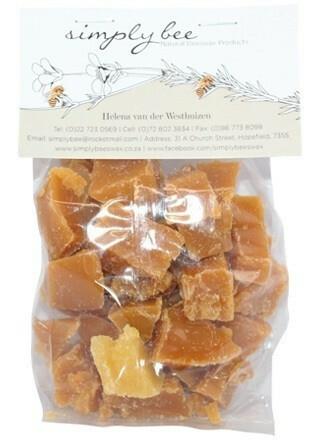 I just love this product - the best beeswax ever! It smells great - used it to make my body butter and for my lip gloss - great product! Just wish it came in a bigger bag though..
Best beeswax ever! Use it in my hot process natural handcrafted soaps recipes, in my furniture polish recipe, in my facial products etc. Sorry about this, but it smells very bad like smoke doesn't matter what I but in still smoke and the one I received was with a greener in coloring not golden brown like the lip ice? I would really not recommend this if it's the same as the ones I received. Still very bad smoke smell horrible really. I can't do anything with it. I cannot make my body butters without this. WILL WAIT LONG FOR THIS ORDER!!!!! Sorry about this I am sure this will be a LOVELY product…. I’ve ordered this last week, yesterday I received an email saying that you are out of stock and will only receive this next week so you can courier maby Monday… now I see you have plenty of stock? Essential emulsifier for home-made lotions. I make my own creams with coconut oil, which always separated until I emulsified them with Simply Bee Pure Beeswax. Wonderful addition to diy beauty regime. I use beeswax in some homemade beauty products. This one is conveniently broken up into smaller chucks, which makes it much easier to use. One of the best beeswax I have seen/used so far. This product smells great,..and is just perfect for my DIY recipes. The beeswax is of excellent quality! 100% natural product.